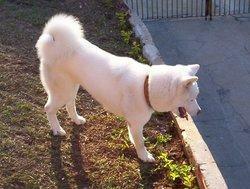 The Akita or Akita Inu is a breed of huge Japanese dog. A fully grown male adult can be over three feet tall at the shoulders. On average a full grown male can reach 120 pounds, a female around 90-100 pounds. Akitas come in many different colors and patterns including white, brindle, black, fawn, and many combinations of these. The Akita is the National Dog of Japan and is immensely powerful and imposing animal. Dignified, aloof and with a fearless temperament the Akita is a no nonsense protector of family and home and must be supervised with visitors and visiting children. Early socialisation training is essential to ensure a confident trouble free family pet. The coat is dense and moults two or three times a year during which time and continous attention to grooming is important during these periods.